My family has been in the distilling business for generations. 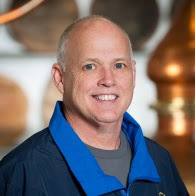 Personally, I began my career in distilling as a 7th generation distiller in 2010, when I started working on the Limestone Branch Distillery. No question about it, the day Limestone Branch became part of the Kentucky Bourbon Trial Craft Tour. It was a special day that my brother and I were able to share along with my father, who was able to see the reestablishment of our family in the distilling business. He was very proud! I remember my first taste of bourbon, I was about four years old and had been coughing all night. My mother sat me up on the kitchen counter and mixed a little sugar in Jim Beam white label. It kept me from drinking for years to come. The first actual dram was Yellowstone which was always in the house. To me whisk(e)y is the spirit of the people and their environment. Having grown up in Kentucky bourbon country, I have always felt it was a spirit that grew out of the culture, our history and our environment. This was driven home to me after I spent a week on Islay. I had never been a fan of heavily peated whisky, but when I was there, it felt and tasted so right. It was the perfect expression of the island, which sprang from the soul of the area, the salt spray, the chill in the air and the oysters. It all came together in the whisky, which was true to the area and reflected its terroir. We have no plans to keep expanding our product line or our production. My family has been whisky makers since at least 1795, that’s what we do. In five years, God willing and the creeks don’t rise, I will be doing the same thing I am now, which is trying to make an exceptional whisky, with a little more aged product to work with. Yellowstone Limited Edition 2018, it has become my nightly sipper, it is fantastic! I have a sweet tooth, so I occasionally enjoy some bitter sweet chocolate after a dram of bourbon. At the end of the day, when I am winding down or anytime with friends and family. I think one of the next big things we’ll see in the industry, will be the growth of interest in the wider category of whisky by its new generation of consumers. As they become more comfortable with their own taste they will begin to explore all whisky; American, Scotch, Irish and Japanese. Hopefully with this will come less of a pack mentality, people chasing the latest mob endorsed unicorn. Instead enjoying what they understand and prefer. A great 7 to 12 year old bourbon, of course I prefer Yellowstone. Many thanks to Stephen Beam. Who will be our next Whisky Insider? Click back soon to find out!